منصوری, علی, ریانی, مسعود, شهدادی, حسین, لکزایی, حسین. (1396). مقایسه رضایت زناشویی و تعارض کار/ خانواده در پرستاران با شیفت‌های کاری ثابت و متغیر. 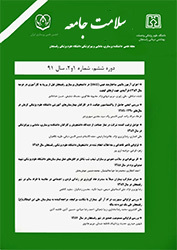 سلامت جامعه, 9(2), 65-74. علی منصوری; مسعود ریانی; حسین شهدادی; حسین لکزایی. "مقایسه رضایت زناشویی و تعارض کار/ خانواده در پرستاران با شیفت‌های کاری ثابت و متغیر". سلامت جامعه, 9, 2, 1396, 65-74. منصوری, علی, ریانی, مسعود, شهدادی, حسین, لکزایی, حسین. (1396). 'مقایسه رضایت زناشویی و تعارض کار/ خانواده در پرستاران با شیفت‌های کاری ثابت و متغیر', سلامت جامعه, 9(2), pp. 65-74. منصوری, علی, ریانی, مسعود, شهدادی, حسین, لکزایی, حسین. مقایسه رضایت زناشویی و تعارض کار/ خانواده در پرستاران با شیفت‌های کاری ثابت و متغیر. سلامت جامعه, 1396; 9(2): 65-74. مقدمه: دو حیطه­ بسیار مهم زندگی شغل و خانواده می­باشند. رضایت زناشویی به تطابق بین وضع فعلی فرد با وضعیت مورد انتظارش از زندگی زناشویی، اطلاق می­گردد. تعارض کار/ خانواده به عنوان ناسازگاری بین نقش­های کاری و خانوادگی توصیف می­شود. به نظر می­رسد این نوع تعارض، در کارکنان دارای کار شیفتی پر رنگ باشد لذا، این مطالعه با هدف مقایسه رضایت زناشویی و تعارض کار/ خانواده در پرستاران با شیفت­های کاری ثابت و متغیر انجام گرفت. مواد و روش ­ها: روش این مطالعه توصیفی مقطعی می­باشد. جامعه آماری این مطالعه را 264 نفر از پرستاران تشکیل می­دادند و از بین آن ها 242 نفر که شرایط شرکت در مطالعه را داشتند به روش سرشماری وارد مطالعه شدند. جهت بررسی نمونه­ها از پرسشنامه رضایت زناشویی Enrich و پرسشنامه تعارض کار/ خانواده Carlson استفاده شد. پس از جمع­آوری اطلاعات، داده­ها توسط نرم­افزار SPSS ویرایش 18 با استفاده از آزمون­های ضریب همبستگی پیرسون، تی مستقل و تحلیل رگرسیون چند متغیره در سطح معنی­داری (05/0 p<) تجزیه و تحلیل شدند. یافته ­ها: میانگین رضایت زناشویی در پرستاران شیفت ثابت 57/30±27/171 و در پرستاران با شیفت متغیر 99/23± 06/164 بود. در واقع، آزمون تی مستقل تفاوت معنی­داری را در زمینه رضایتمندی زناشویی بین این دو گروه نشان داد (017/0p=)، همچنین نتایج نشان داد که میانگین تعارض کار/ خانواده در پرستاران شیفت ثابت 85/0± 26/3 و در پرستاران با شیفت متغیر 69/0± 34/3 بود که تفاوت آماری معنی­داری در این زمینه بین دو گروه وجود نداشت (38/0p=). نتیجه­ گیری: با توجه به نتایج بدست آمده در این پژوهش آموزش مهارت­های لازم به نوبت کاران در خصوص مدیریت تعارضات شغلی و خانوادگی و افزایش رضایتمندی زناشویی امری ضروری است. 1M.Sc, Nursing and Midwifery faculty, Zabol University of Medical Sciences, Zabol, Iran. Introduction: Two important areas for every life are job and family. Work/family conflict is described as the incompatibility between work and family roles. It seems that this conflict is highlighted in the staff with shift works. Therefore, this study aimed to compare the marital satisfaction and Work/Family conflict among the nurses with fixed and changing shifts. Materials and Method: This study was a cross-sectional and descriptive-analytical study. The study statistical population comprised of 264 nurses. Among them 242 who had the conditions for entering the study were selected through census method. To examine the samples, Enrich marital satisfaction questionnaire and Carlson work/family conflict questionnaire were used. Data were analyzed using SPSS 18 by using Pearson correlation coefficient, t-test and multivariate regression analysis with a significant level of p<0/05. Results: The results showed that the average marital satisfaction in the constant shift nurses was 171/27 ± 30/57 and in nurses with changing shifts was 164/06 ± 23/99. In fact, based on the obtained results, significant differences were observed in marital satisfaction between fixed and changing shifts (p=0/017). Marital satisfaction was higher in nurses with fixed working shifts. Also the results showed that the mean of work / family conflict in nurses with constant shifts was 3/26 ± 0/85 and in the nurses with changing shifts was 3/34 ± 0/69. Therefore, there was no significant difference between the two groups in this field (p= 0/38). Conclusion: According to the results, teaching the necessary skills to the shift workers about management of job and familial and marital satisfaction is essential. Stutzer A, Frey BS. Does marriage make people happy, or do happy people get married? The Journal of Socio-Economics 2006; 35(2):326-47. Rosen-Grandon JR, Myers JE, Hattie JA. The relationship between marital characteristics, marital interaction processes, and marital satisfaction. Journal of Counseling and Development: JCD 2004; 82(1):58. Taniguchi ST, Freeman PA, Taylor S, Malcarne B. A study of married couples' perceptions of marital satisfaction in outdoor recreation. The Journal of Experiential Education 2006; 28(3):253-6. Fisher TD, McNulty JK. Neuroticism and marital satisfaction: The mediating role played by the sexual relationship. Journal of family psychology 2008; 22(1):112-22. Mazerolle SM, Bruening JE, Casa DJ. Work-family conflict, part I: antecedents of work-family conflict in National Collegiate Athletic Association Division IA certified athletic trainers. Journal of athletic training 2008; 43(5):505-12. Costa G. Shift-work health consequences. International Encyelopaedia of Ergonomics and human factors. 2001; 2(9):1359-360. Elquist M. Marital satisfaction and equilty in work/family responsibilities in dual-earner shift worke. Journal of Family Economics Association. 2004; 19, 70-84. Colligan M, Rosa R. Shift work effect on social and family life. Journal of Occupational Medicine 2001; 5, 315-22. Kossek E, Noe R, Demarr B. work-F role synthes: indiridual and organizational determinats. International-Journal of conflict management 2002; 10: 102-29. Presser HB. Nonstandard work schedules and marital instability. Journal of Marriage and Family 2000;62(1):93-110. Fowers BJ, Olson DH. ENRICH Marital Satisfaction Scale: A brief research and clinical tool. Journal of Family psychology 1993; 7(2):176-85. Carlson DS, Kacmar KM, Williams LJ. Construction and initial validation of a multidimensional measure of work–family conflict. Journal of Vocational behavior 2000; 56(2):249-76. Grosswald B. The effects of shift work on family satisfaction. Families in Society: The Journal of Contemporary Social Services 2004; 85(3):413-23. Byron K. A meta-analytic review of work–family conflict and its antecedents. Journal of vocational behavior 2005;67(2):169-98. Huston TL, Caughlin JP, Houts RM, Smith SE, George LJ. The connubial crucible: newlywed years as predictors of marital delight, distress, and divorce. Journal of personality and social psychology 2001; 80(2):237-52.